We caught up with SAI Ambassador Jackie, who took some time to answer some questions about her time abroad. It’s hard to pick just one moment, so I’ll pick my FIRST favorite moment. 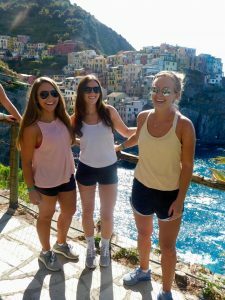 When my roommates and I went to Cinque Terre a few days after arriving in Florence. It was the first of many trips we took together. We were still getting to know each other and adjusting to our new normal. We arrived on the train to the second stop, Vernazza. We sat and watched the waves crash up against the sea wall and snapped photos and videos to capture the moment. I was on awe that this is now my life for the next semester. A few of my roommates and I snapped a photo with the beautiful town of Vernazza as a backdrop. I vividly remember while taking the photo that I had the purest sense of happiness and excitement; it’s a feeling I’ll never forget. At that moment, I knew that the next few months would be the best months of my life, and sure enough that feeling became reality. Take risks, do something that you wouldn’t normally do, talk to people you might not usually talk to, eat food that you aren’t sure that you’ll like. Never waste a day abroad because when it’s time to leave you’ll wish you had just one more day (or semester). 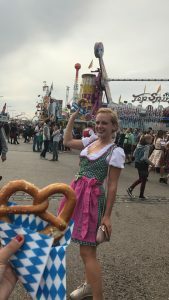 Oktoberfest with one of my roommates! Don’t be afraid to step out of your comfort zone. Listen to the people around you and pick up on key phrases. 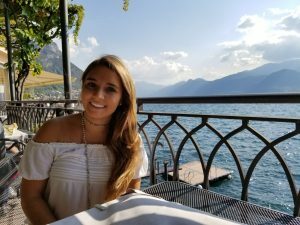 I didn’t know any Italian before studying abroad in Italy but I was able to learn short phrases that allowed me to order food, ask simple questions, and understand what people were saying to me. Most of the Italians I came across knew some English so it was much easier than I expected to communicate, but the locals appreciate when foreigners attempt to speak Italian when living in their country. 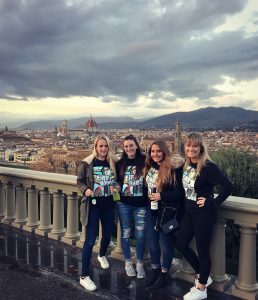 Jackie was a fall 2017 SAI Florence student from the University of Tennessee Knoxville.